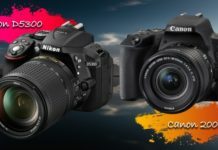 Verdict – Though Nikon D5600 is a little pricey but it is the best Dslr camera under 50000 Rs range, D5600 announced on nov 2016 has all the needed features a dslr should have under the 50,000 price range like large size sensor, SnapBridge and easy to use user interface, light and compact body, high ISO range are some genuinely useful differentiators among its rivals which makes it a best dslr under 50k and an excellent option for photography enthusiasts. 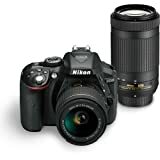 Nikon D5600 is a small update of the previous excellent camera – D5500. 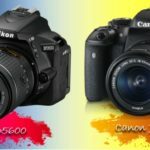 In comparison to it’s nearest canon competitor canon 750D the D5600 offers 10% larger pixel area, 20 more focus points, time lapse recording, higher color depth and dynamic range, better low light ISO performance and battery life, great built-in flash, great video recording with Rs 5,000 more than Canon 750D. Whereas, Canon 750D competes D5600 with all cross type 19 AF points and Better moiré control. So, if you are more of in motion photography than 750D is slightly better than D5600. But overall, Nikon D5600 is the best Dslr camera under 50000. Canon 750D captures stunning images effortlessly for its provided price, hence it is the best budget dslr under 50,000 rs. 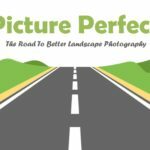 The camera captures detailed , high-resolution and vivid images with perfect exposure and auto white balance (color) in any situation with no editing or processing required. The camera is capable of keeping track to fast moving subjects using its all-cross-type 19 AF point fast auto-focus system. If you have multiple objects in a photo you can set it to “auto AF-area” select mode and it accurately focuses on all the subjects automatically and tracks them very quickly making it a best dslr camera under 50000 list. But it has no face recognition, so you have to assign AF points manually for people pictures and video autofocus is not as good as Nikon D5600. 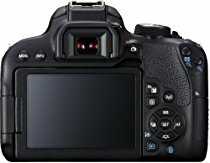 Canon EOS 750D will allow you to take very memorable images even under low light condition due to its automatic flickering light synchronization and desirable ISO 100 – 12800 (25600 expandable) range and its speed-lite flashes and fast aperture lenses that ensures high quality and depth control images even if the flash is off. Have any questions regarding Canon 750D find answers here and here. Bluetooth & NFC to connect with Nikon’s Snapbridge app. Remote control & release via Bluetooth and the Snapbridge app, but doesn’t works with infra-red remote anymore. Improved touchscreen, quick switching and cropping of images. Depreciated 640 x 424p video mode; only 1,080p and 720p available. No analog NTSC/PAL video output. Once you connect Nikon D5600 Bluetooth to free SnapBridge app on your smartphone, JPEG images can be automatically transferred in bulk from the D5600 to your smart-device or you can select individual images to transfer at full size (but JPEG-only). SnapBridge uses Wi-Fi to transfer movies wirelessly, and to capture still images via remote. So, you can use your smartphone as a remote to control the camera. Nikon D5600’s 24MP sensor captures much detailed, natural looking and sharp images in comparison to other best DSLR cameras under 50000 Rs. Due to no anti-aliasing it produces false color in high contrast scenes. 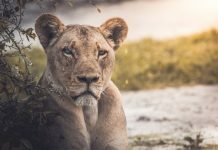 So, you might need to dial in some negative exposure compensation to regain shadow detail and retain highlight detail in post-processing if required. The D5600’s auto white balance performed good in a range of lighting conditions due to its desirable ISO range, JPEG colors are vibrant and bright. Skin tones are quite pleasing to eyes in comparison to other cameras under 50,000 rupees. Nikon D5600 features 39 autofocus points which desirably covers around the viewfinder. 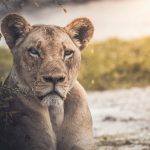 You can keep the track of the subject and its movement over the time around the frame, as well as towards and away from the camera with the help of its metering sensor to view the scene and identify the pointed subject. 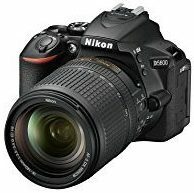 Have any questions regarding Nikon D5600 find answers here and here. Canon 200D also featured in our “Best Dslr under 40000 Rs” list. It is a perfect mini Dslr for beginners to easily pick and use without the application of traditional size of a DSLR. Thanks to its 3″ vari-angle selfie friendly LCD and touchscreen control, plus Dual Pixel AF for speedy on-screen autofocus, microphone port and simpler button layout compared to other DSLR cameras. Connect smart phones with built-in Wifi and NFC for seamless transfer of images or share them on social media. you can also use your smartphone as a remote to control Canon 200D. In Live View mode, the EOS 200D (also known as rebel SL2) uses Dual Pixel CMOS AF which makes 80% (broader coverage than the viewfinder system) of the sensor area to become phase-detect AF points. 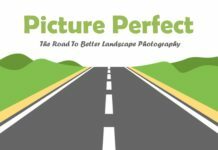 It provides quick, seamless and responsive shift when switching back to taking pictures or switching the focus from one subject to another. But it also drains the battery. When using the viewfinder AF system one can manually select which of the 9 AF points to use, or let the camera automatically select from them. Read this User Experience of Canon 200D here and here. Have any questions regarding Canon 200D find answers here and here. Canon 800D (Rebel T7i) uses the same technology as pro DSLR Canon 5D Mark IV for noise reduction making it one of the best DSLR camera under 50000. DIGIC 7 chip handles 14 times more information than the Canon 750D’s DIGIC 6 processor, which also helps in delivering reduced high-ISO noise performance and also an improved autofocus performance. With all-cross-type 45 AF points and 24MP Dual pixel sensor and 6fps burst shooting you can expect fast and accurate autofocus, AF points are more likely to lock onto its target it means that autofocus has become much better of already excellent autofocus of 750D, so you can capture all fast moving objects without moiré and with 45 AF points and Digital video stabilization video autofocus has also become far better than 750D. 800D produces excellent JPEGs color and competitive image quality even in low light due to its 100 – 25600 (51200 expandable custom setting). 800D is consistent in shooting through both, “optical viewfinder” or “live view, using the rear screen”. This relatively seamless consistency means you can shoot using the rear touch-screen just as if it were a smartphone making it one of the best DSLR camera under 50000 rupees. Have any questions regarding Canon 800D find answers here and here. Nikon D5300 has less features than the above cameras and can be bought under 40,000 Rs with single lens kit, but the reason why we also recommend it in best dslr camera under 50000 Rs is that it is one of the popular camera under 40,000 and if some of the above cameras feature are redundant to you or if you don’t use those feature much, like if you are ready to sacrifice on touch screen you can buy an extra lens (AF-P DX 70-300mm f/4.5-6.3G VR) worth Rs 19,000 with Nikon D3400 dual lens kit. D5300 has a same 24MP high resolution sensor. So The camera is ideal for low light conditions hence suitable for both indoor and outdoor sho, you can just point and shoot grat readily detailed and true color high quality images. It produces great images with natural light and color condition due to its D-lighting function. Its 39-point Autofocus that is capable of locking and tracking your subjects even when they are moving and Its ISO range 100 – 12800 (25600 expandable) allows you to click desirable images even in low light and with extra 70-300mm lens aperture range increases ans so will your autofocus thus making it to feature among the best DSLR cameras under 50,000 Rs. 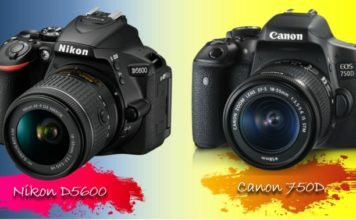 Have any questions regarding D5300 find answers here and here. Due to its 11 fps Continuous shooting you can easily capture fast moving subjects, If you combine 11fps with 179 AF points, it is the most super-fast and accurate focus camera under RS 50,000 but the catch here is that it drains the battery quickly. Sony Alpha A6000L Features among the best DSLR cameras UNDER 50,000 because of the OLED EVF feature that is responsible for the 100% frame coverage and wide field of view. It has a 4D Focus that envelopes the scene with a wide coverage area and focuses on subjects quickly even the subject is in motion by predicting its movements over time. Have any questions regarding Sony A6000 find answers here and here. Sony A68K have got 79-phase-detection AF points and 8fps continuous shooting speed that keeps tracking of fast moving subjects and sensor shift image stabilization makes it more better by countering camera shake. It allows you to capture all the bright and reds shades of environment making to be one of the best DSLR camera under 50000 Rs. It produces minimal noise and high image quality. Shoot images with great colours and contrast with its OLED feature. But it has no time-lapse recording. Sony Alpha A68K is known for beautiful portrait pictures and fast face detection. AF point ensures that the images produced are sharp since it focuses on the face by detecting on the eye that is on focus. The camera posses a control wheel and will allow you to quickly change the camera settings as you look at the viewfinder making it best DSLR camera under 50000 Rs. 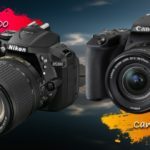 In the end, it all depends on what your needs are, if you are looking for a best DSLR camera under 50000 in India 2018 with readily great image quality and reasonable video quality with compact body go for Nikon D5600 and if you want a dslr mostly for still photography then Canon 200D is the best dslr camera under 50000 for you. And if you are looking for a budget best dslr camera under 50000 Rs with fast and high speed action photography as a priority then go for Canon 750D. If you have a question leave a comment below.